Becoming “Rich” in a Non-Profit Career (by robbing banks, kidnapping and other magic tricks). Patricia tells of her professional journey in the non-profit sector and provides lessons on how to motivate, empower, and engage staff, volunteers, and customers. She also provides insight on how to secure in-kind support and sponsorships. The cornerstone of this talk is a behind-the-scenes look at the uplifting story of how she turned San Francisco into Gotham City to allow one 5-year old cancer patient the opportunity to live his dream: to be batman. In doing so, she inspired millions worldwide and the subject is a feature-length documentary: Batkid Begins. The audience will learn about how to manage a story if it goes viral, how to solicit for professional assistance for crisis communication, and how social media can be your friend. Lastly, this talk inspires the participants to engage in their own communities and be involved in the causes that are most important to them. Leadership Lessons from an Accidental CEO. A robust and information-backed inspirational speech, Patricia Wilson shares the many lessons she has learned during her tenure in for-profit and non-profit leadership roles. She believes that the most valuable asset an organization has is its talent and says that her most significant accomplishment wasn’t pulling off the famous Batkid wish but rather assembling the team that made it possible. Told through heart-warming stories from Make-A-Wish, she shares what to look for in the hiring process, the importance of building and retaining great teams, how to set the tone for your group, creating an atmosphere of excellence, and why it’s good to sometimes be affectionately known as the “B.I.C.” With the mantra of “Give credit, don’t take it,” her leadership lessons resonate across business sectors and inspires others to embrace leadership and become their own CEO. Wilson is sought-after for her inspirational insights on leadership, philanthropy, social media, and public relations. Patricia's ability to develop a high-performing team and create extensive community engagement garnered her worldwide recognition—she is a main character in the documentary “Batkid Begins,” released in theaters nationwide in 2015. She is also the subject of an upcoming feature film about her work at Make-A-Wish starring and produced by Oscar-winner Julia Roberts. 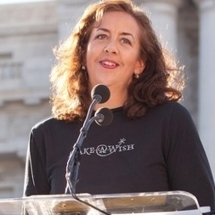 Patricia Wilson is the former CEO of Make-A-Wish, Greater Bay Area, which is one of the nation’s largest Make-A-Wish chapters, granting more than 400 wishes per year for children with life-threatening medical conditions in northern California. She is best-known as the mastermind behind the incredible effort to turn San Francisco into Gotham City so that cancer patient Miles could become Batkid for a day. A popular TED speaker, Wilson is sought- after for her inspirational insights on leadership, philanthropy, social media, and public relations. Her ability to develop a high-performing team and create extensive community engagement garnered her worldwide recognition—she is a main character in the documentary “Batkid Begins,” released in theaters nationwide in 2015. She is also the subject of an upcoming feature film about her work at Make-A-Wish starring and produced by Oscar-winner Julia Roberts. It will be released through the Red Om Films banner, and New Line Cinema (Warner Bros.) purchased the rights to develop the narrative film. A mission-based CEO committed to making the world a better place, Patricia has earned a reputation for her integrity, sound business judgment, demonstrated financial acumen and superior communication skills. Through uplifting and heart-warming stories, she shares the many lessons she has learned during her tenure in for-profit and non-profit leadership roles, including the importance of building and retaining teams, creating an atmosphere of excellence, and why it’s good to sometimes be affectionately known as the “B.I.C.” One of the most inspiring speakers on the circuit, she assumed her role with Make-A-Wish in 1998 when the chapter had only four employees and a $1.6 million budget. By 2016, she was managing a staff of 28, more than 600 volunteers, and a budget of $10+ million. Batkid Saves Gotham. To fulfill a wish for a five-year-old leukemia survivor named Miles who wanted to be a superhero, Wilson assembled a gifted team of thousands of public servants and community supporters. For a day, San Francisco was transformed into Gotham City, complete with a bat signal and Police Chief Greg Suhr’s plea for help. Miles, in full Batgear (and with a grown-up Batman), rescued a damsel in distress tied to cable car tracks, foiled the Riddler’s bank robbery attempt, paused to eat a burger, and then thwarted the Penguin’s attempt to kidnap beloved San Francisco Giants mascot, Lou Seal. To cap the day, Mayor Lee presented Miles with a key to the city (made of chocolate). Prior to joining Make-A-Wish, Patricia held leadership roles at WHRO and KQED, the 5th largest public broadcaster nationally. She also produced several educational public TV series before serving as executive director of a science and wildlife environmental center. Patricia currently provides consulting to several startups in the Bay Area and Vancouver. She also serves on the board of Illuminate (Bay Lights) and Friends of the Urban Forest. "Patricia received rave reviews and her story touched many people in the audience. She was also very easy to work with and went the extra mile for IMA. She participated in various calls to brainstorm how to best work with Make-A-Wish and participated in our closing session run through onsite since she was a part of it."